1. Take a large pan and heat a glug of oil over a medium heat. Cook the onion, garlic and peppers until they all begin to soften before adding the herbs, spices and chillies. Cook for a further minute and then add in the tomato puree and cook for an additional minute. I used Mexican arbol chillies which have a real kick and are well worth a try if you haven’t before. I pricked the chilli a couple of times to help the flavour infuse. 2. Add the drained beans, tomatoes and stock and bring to a gentle boil before reducing to a simmer. You can then cook this on the hob for an hour or two until the sauce is thick and reduced. 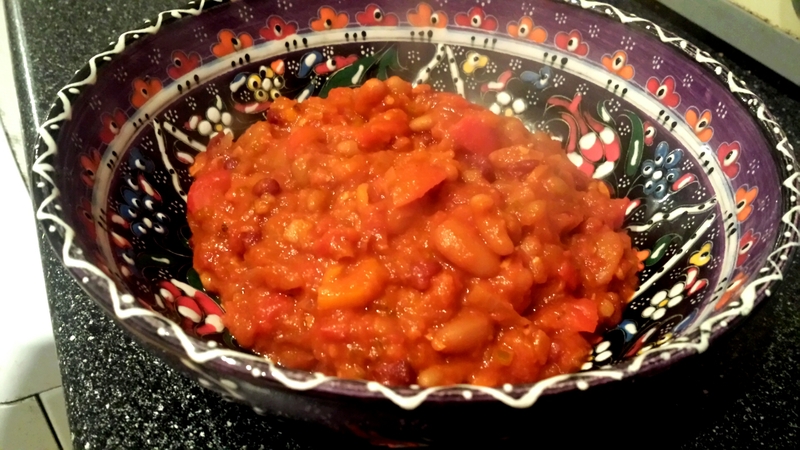 This chilli also cooks well in the oven on a low heat for a couple of hours if you prefer. 3. Rescue the chillies before serving so none of your guests have a nasty surprise when they bite into one. Serve with rice or homemade tortilla chips and soured cream. To make tortilla chips simply cut a stack of tortilla wraps in wedges and shallow fry in vegetable oil until golden on both sides. 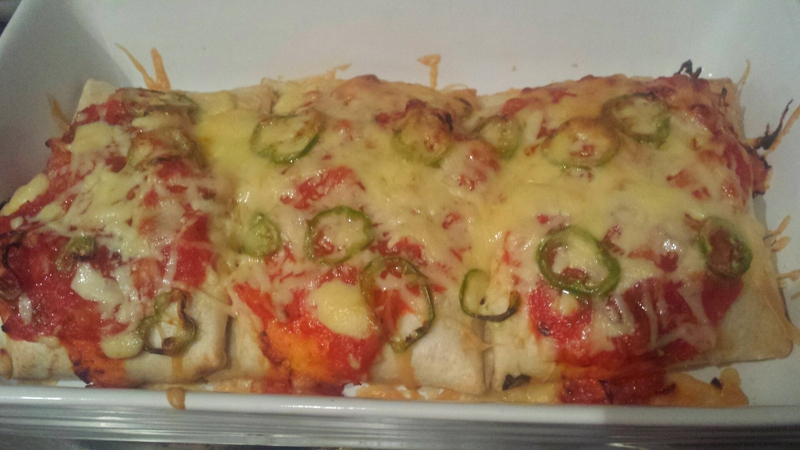 All you need to make a ‘burrizza’ is tortilla wraps (allow one per person as they are filling), a handful of sliced jalapeno rings, grated cheese and tomato salsa. 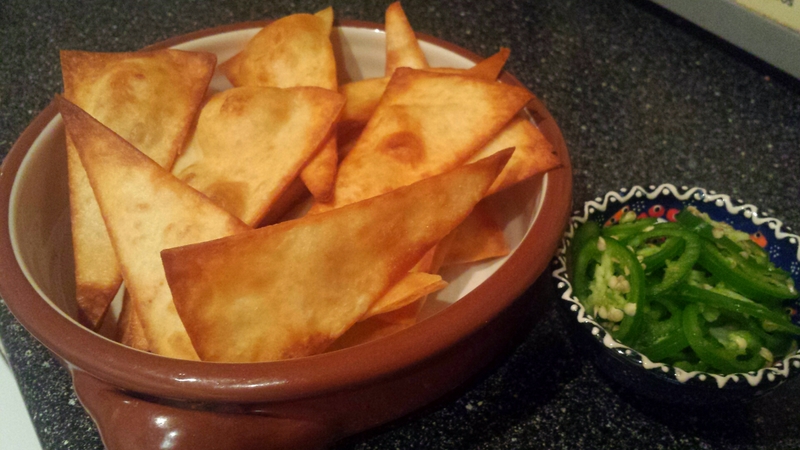 Simply fill a tortilla with some of the chilli and fold. Pop the folded tortillas in an overproof baking dish so they are nice and snug with the folded side placed on the bottom so they hold together. Spoon over the tomato salsa before topping the wraps with the chilli and cheese. Bake in an oven which is heated to 180c/ 160 fan for around 20 minutes until the chilli is warmed through and the cheese melts. Why choose between a burrito and pizza when you can have a twist on both? !